Other climbers thought the jacket was stylish and wanted to know where they could buy their own versions of the clothes! The results of a unique experiment on Mount Everest confirm that the clothing of the 1924 climbers George Mallory and Sandy Irvine would not have prevented them from reaching the summit, as many had believed. The findings are a step closer to proving the men could have reached the top, 29 years before Tenzing Norgay and Sir Edmund Hillary. Over the past few weeks, climber Graham Hoyland has been putting the old-style clothing worn on the fateful Mallory expedition to the ultimate field test on the world's highest mountain. Wearing replica gear made from gabardine, wool, cotton and silk, he wanted to disprove the common myth that the 1920s climbers were ill-equipped to reach the summit. "This is just another brick in my wall of evidence," Hoyland said. 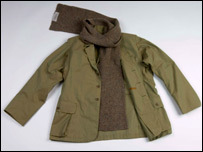 Following the discovery of Mallory's body on the north face of Everest in 1999, a team of forensic textile experts from Lancaster, Leeds, Southampton and Derby universities embarked on an experiment to recreate the outfit from samples of Mallory's clothing which had been preserved in ice. The three-year project, lead by Professor Mary Rose and Mike Parsons, revealed that Mallory's clothing was highly effective at providing protection at high altitude. The layered natural materials used to construct the garments were found to be excellent at trapping air next to the skin. The outer layer of gabardine was hardwearing and water-resistant yet breathable. But the clothing was also lighter than modern gear - the lightest ever to be used on Everest. Parsons said: "The results stand out as a challenge for future outdoor innovators because Mallory's clothing and footwear was 20% and 40% lighter respectively." The results of Hoyland's in-the-field experiment have now confirmed the experts' investigations. 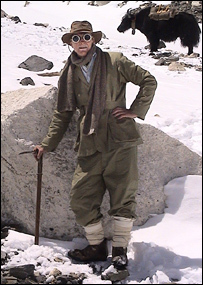 Wearing the replica clothing for two days on Everest, Hoyland tested the suit alongside the expedition leader who was wearing a typical modern down suit. "I immediately found the underclothes warm to put on, whereas the modern polypropylene underwear feels cold and clammy," said Hoyland. "When exposed to a cutting wind blowing off the main Rongbuk glacier, I found the true value of the Gabardine outer layers. These resisted the wind and allowed the eight layers beneath to trap warmed air between them and my skin. "We both got too hot working on the glacier so we felt that Mallory's clothing would have been more than adequate to climb to the top in, although it would be hard to survive a bivouac near the summit." Hoyland also discovered that the clothes were more comfortable to wear than modern day gear. "Like most mountaineers, I am used to synthetic outdoor clothing: polypropylene underclothes and outer fleeces which are bought pre-sized, off the shelf and never quite fit properly. 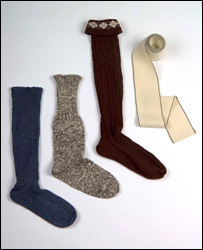 "They are unforgiving in stretch, and begin to smell unpleasant if worn for more than a couple of days. There is a harsh synthetic sensation next to your skin. By contrast, the Mallory clothing was made to fit me. "This meant that the shirts didn't ride up, exposing my kidneys when I stretched, and the whole ensemble felt of a piece when walking. Instead of feeling bulky, the layers fitted very well." But the main difference for Hoyland was the level of movement the clothing allowed - which can mean the difference between life and death when at high altitude. "The patented Pivot sleeve of the jacket enabled me to lift my arm to full extent when cutting steps with an ice axe without displacing the warm layers of air. If you can reach above your head and climb faster, you could get to the summit before nightfall." Mallory's clothing did have one major drawback, as Hoyland discovered. "The immediate problem was fastening buttons with cold fingers. I suspect Mallory and Irvine would have put the clothes on at Advanced Base Camp and left them on for the duration. Fly buttons may have been left undone as there are enough layers to interleave." But Hoyland says: "All the other climbers thought the jacket was stylish and wanted to know where they could buy their own versions of the clothes!" The summit attempt and subsequent deaths of Mallory and Irvine sparked the biggest mountaineering mystery, which continues to puzzle the climbing world today. Norgay and Hillary are credited with the first successful summit, in 1953. But a few, like Hoyland, still believe Mallory could have reached the top and are gradually piecing together the evidence to prove it. Hoyland is a great nephew of Howard Somervell, one of Mallory's climbing companions who lent Mallory his camera and was one of the last to see him heading for the summit. Hoyland believes the Kodak camera, which is still to be found, could also hold vital clues about Mallory's ill-fated climb.